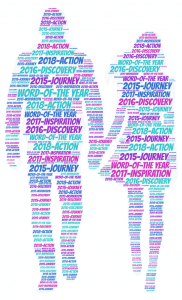 Can a word or a few words make a difference in your life? Yes having a word or phrase for the year, sets the tone. Personally I have seen this in my own life both professionally and personally. I started this in 2015, and my word was Journey. In that year, my journey led me to having my own office space for my part-time practice. In 2016, my word was Discovery. That year I discovered how to better market my private business, so I ended quitting my full-time job and growing my practice to full-time business. In 2017, my word was Inspiration. In 2017, I was contact by production company to create my own talk show. Thus www.bringingintimacyback.com – a radio and TV talk show has now been created and it aired in February 2018. In 2018, my word was Action. In 2018, I did 66 TV and Radio Shows and met wonderful professionals as my guests on the show and I became President of Gulf Coast Mental Health Counseling Association. In 2019, my word is Balance. Due to changes in my family and my various responsibilities, I want to make sure that I am healthy in all the 8 dimensions of wellness – Emotional, Environmental, Financial, Intellectual, Occupations, Physical, Social, and Spiritual – and I want to inspire others to do the same.